Aircraft inspection involves different and difficult geometries which implies multiple inspection solutions and diversification of inspection equipment. Therefore, it is important to adopt a multi-purpose inspection system to selectively choose the required inspection procedure and at the same time having the ability to combine inspection techniques to optimize the cost-effectiveness of the system. In this work, we demonstrate the ability to combine guided wave inspection techniques (GW), Edge-Of-Light EOL, conventional ultrasonic pulse-echo (UT) and eddy current techniques (ET) for corrosion detection in aircraft structures. This paper shows that UT and ET as an extremely cost-effective solution in terms of inspection implementation, efficiency and resolution. It also demonstrates how important is the GW approach for rapid inspection of large and inaccessible aircraft structures. Using a Portable automated PC-based scanner; two large specimens were inspected with guided waves, UT and ET techniques. Large area defects were first located by GW and quantified using UT and ET. 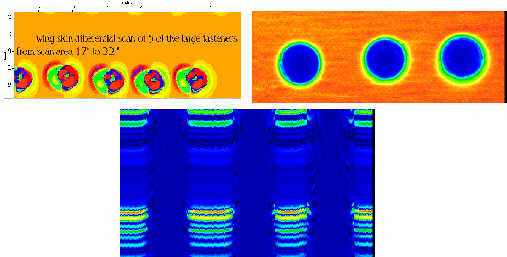 The resulting scan images from the three inspection techniques were used to improve inspection reliability and defect interpretation in terms of detectability of corrosion or disbonds in aircraft structures. In the case of aging aircraft, the main structural problems are directly related to corrosion detection. However, for aircraft with a number minimum life-cycle hours, structural defects can be manifested as: Surface cracks; Fatigue cracks and corrosion in the fasteners; Skin disbonds and corrosion (in multilayered structures). Surface cracks are usually located on the open surface of the skin structure. Big surface cracks can be detected visually if they are located on the visible side. However, hidden surface cracks are not visible and can be detected by using ultrasonic pulse-echo, eddy current or guided and surface wave inspection techniques. Detection of fatigue cracks and corrosion around the fasteners of aircraft structures is a major problem for both civil and military aircraft fleets. In some cases, the fatigue cracks initiating under the fasteners are smaller than the countersink width of the rivet. It is important, therefore, to inspect the flaw region using ultrasonic angle beam pulse-echo technique or guided waves. Aircraft skin structure requires maintaining good bond or sealing integrity. Under this work, Tektrend has been developing and extending the capabilities of its PANDA scanning system for combining inspection techniques and their results to detect common defects especially disbond, exfoliation and hidden corrosion in airframe structures. Our objective is to develop a multi-purpose inspection system to selectively choose the required inspection procedure and at the same time having the ability to combine inspection techniques (by applying data fusion) to optimize the cost-effectiveness of the system. Currently for aerospace and spacecraft, a variety of NDT inspection techniques are used during maintenance of structures. Visual, liquid penetrant, magnetic particles, ultrasonics and eddy currents are some of the inspection techniques generally applied. Other techniques such as tomography, holography, and shearography have gained less attention because it require large computerized equipment. Unfortunately, not all of these techniques are appropriate when inspecting some special common defects such as fatigue cracks and exfoliation in the fasteners. In addition, they are unable to inspect bends and reach hidden parts of the structure. In this case, conventional and nonconventional ultrasonic and as well as current inspection techniques can be combined to give a reliable mean of defect detection and quantification. As part of Tektrend's research program on the study of NDI reliability and its implementation, a series of experiments have been carried out using simulated and real specimens to determine the reliability of three NDE techniques for disbond, corrosion and exfoliation detection in aircraft structures. Corrosion levels in the specimens then were characterized by these multiple NDI techniques. Specimens with real and simulated defects were provided to us by National Research Council Canada's Institute for Aerospace Research (IAR/NRC) and ARINC Inc Oklahoma city as part of mutual evaluation and research work. 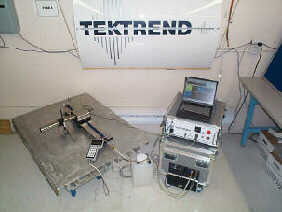 The system used in our experimentation is Tektrend's PANDAÒ System (Figure 1). The system is designed to be modular and portable to provide rapid and automated scanning of aircraft structures. The system can be configured for conventional UT and ET transducer positioning, providing acquisition and C-scan imaging. It can also be configured for guided wave inspection (GW), providing cost effective, practical nondestructive evaluation. In addition, implementation and installation of EOLä (Edge-Of-Light) sensor on the system is currently under development. EOLä is an enhanced optical NDT technique developed at the Institute for Aerospace Research, National Research Council Canada and exclusively licensed to Tektrend. This technique converts changes in surface slope into light intensity changes in an image created with an optical sensor. Experiments were conducted on two wing skin specimens. Detectability of disbond/corrosion in lap splice joint and corrosion under fasteners of wing skin structures was investigated. Tests were first carried out on 1mm thick lap joint specimen, which was provided by NRC/ IAR Aircraft Specimen Library. 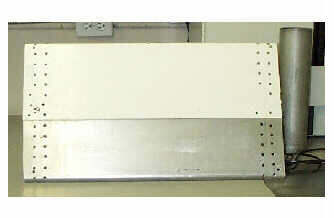 The provided lap joint 46l2-specimen is from a retired Boeing 727-235 with enclosed corrosion between its overlapped plates. This specimen contains about 18" (300 mm) of riveted lap splice joint from a longitudinal fuselage joint. Guided wave inspection was performed on the lap joint specimen and along the X-direction using single pass in pulse-echo at 1.5 MHz. The corroded area between the layers in the lap joint scattered the generated guided mode and produced energy leakage in the bonded aluminum layer[2,3](Figure 2a). The non-corroded areas are characterized by high amplitude signals, signals indicated by red color. Corroded areas resulted in a reduction of amplitude of the received signals as shown by the low amplitude echoes at both ends of the specimen. The interruptions between signals in Figure 2a are due to the presence of rivets. The specimen was also inspected using eddy-current, Edge-Of-light as well as contact ultrasonic pulse-echo. EOL inspection technique detected the pillowing and showed that corrosion in the specimen is concentrated in slightly to the right side of the panel. Corrosion was detected in the specimen with all the above-applied techniques as shown in Figure 2. However, the setup and inspection time of the GW and EOL techniques were relatively fast compared to the ET and UT setup and inspection time. UT and ET require covering the entire surface of the inspected region with the transducer, whereas the GW and EOL inspect the entire plate with one unidirectional scan. This suggests that for rapid inspection of large area, one could use GW or EOL, however, for very precise quantification of the detected defects, when it is necessary, conventional ET and PE ultrasonic can be used. The same techniques were also evaluated for their ability to detect corrosion damage on 0.25" thick aluminum wing skin of a KC-135 with steel fasteners installed proud. The produced exfoliation on the fastener was located immediately adjacent to the fastener holes of structure. Figures 3a shows Lamb wave scan results using S1 mode with 6.5 mm wavelength at 0.85 MHz in pulse-echo mode. Signals from this scan were collected and presented in a two-dimensional B-scan format. The exfoliated areas are characterized by high-amplitude and larger signals (most of the energy is reflected back to the sender). Defect free areas resulted in low amplitude and shorter duration of the reflected signals. The reflected energy from the right-hand cluster shows a trail of small reflections on both the left and right of the fastener. These regions are indicated in boxes in Figure 3. These reflection trails are clearly distinguishable from the indication of a defect-free cluster shown on the left in Figure 3. Assessment of the fastener hole integrity is based on the presence of a trailing shadow below the fasteners on either side of the main reflection. Although the exfoliation reflectors are more diffuse than the discrete reflectors provided by crack-like defects, the indications are clear. In this test result, GW inspection technique demonstrated practical and reliable for detecting exfoliation in the fastener. It also demonstrated how important is the GW approach for testing inaccessible location such as the shadow under the fastener rivets. In the ultrasonic scan, a 10 MHz transducer in pulse-echo setup was used. The transducer was moved laterally in a raster scan to cover the region of interest. One full RF waveform was acquired at every 0.02" x0.02" along the scan and indexing path. The RF waveform was digitized at 100 MHz. The data for a scan was saved in a file for later retrieval and analysis. In the ET scan, both differential and absolute modes were attempted at various frequencies. 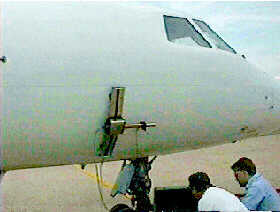 Figure 4a shows that there may be an indication of corrosion around these four fasteners, but since they were protruding from the skin it is difficult to determine if the indication is caused by liftoff from the fasteners or by corrosion indication. The UT results were also analyzed and plotted as B-scans (Figure 4c). Only, minor indications around the countersink of the rivets were detected with the UT scan and no clear and conclusive indications from corrosion were visible. System for combining inspection techniques and their results to detect common defects especially disbond, exfoliation and hidden corrosion in airframe structures was demonstrated. The demonstrated system allows selectively choosing the required inspection procedure and at the same time having the ability to combine inspection techniques to optimize the cost-effectiveness of the system. In addition, a practical inspection procedure was demonstrated using guided waves for fast and effective inspections to detect and locate defects in layered aircraft structures. 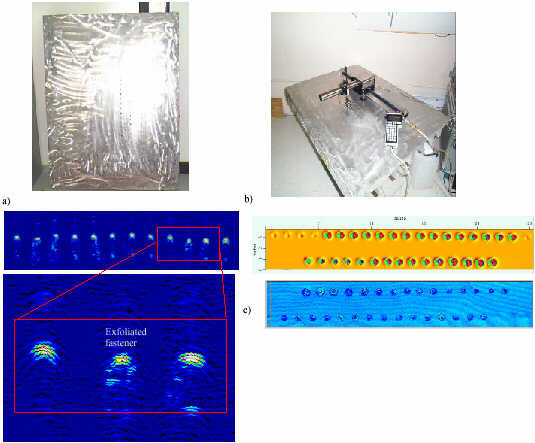 Exfoliation under the fastener heads was detected using ultrasonic guided waves launched from outside the exfoliated region and B-scans were produced to assist in result interpretation. The above results showed that measurement taken by a single NDE technique is not fully reliable and very often incomplete due to the operating range and limitation which characterize the sensor or the inspection technique. The use of multiple NDI has numerous advantages over single sensor inspection technique. Reduction in inspection time, increase reliability, improved defect visualization and information redundancy are the benefits in using multiple NDI sensor information. Under this work, data fusion and Bayesian approach methodology will be investigated for future development and system implementation. D. S. Forsyth, J.P. Komorowski, A. Marincak, R. W. Gould, "Correlation of Enhanced Visual Inspection Image Features with Corrosion Loss Measurements," III International Workshop on Advances in Signal Processing in NDE, Quebec City 02-05 August 1997. A. Chahbaz, J. Gauthier, M. Brassard and R. Hay "Ultrasonic Techniques For Hidden Corrosion Detection in Aircraft Wing Skin," Third Joint DoD/FAA/NASA conference on Aging Aircraft, September 20-23, 1999, Albuquerque, New Mexico.